Legg Mason Real Estate Investors, the owner and redeveloper of the Belleview Biltmore and the Cabana Club, plans to replace the current club and swimming pool with a 6 story luxury 38 room boutique hotel with a large restaurant, bar and beach side cabaña amenity. Lead architect Richard Heisenbottle presented the details of the project in a public meeting last Tuesday at the Belleview Biltmore. Many Sand Key residents say that the project is too commercial for the residential area, although the present site operates commercially. Community activists have organized opposition to the project and have fashioned an information blog and web site pointing out their objections. One is heavy beach use as a result of the hotel and cabanas in an area they consider environmentally sensitive. Ocean views coveted by residents near the project could conceivably be diminished by the height of the proposed building. It measures 67 feet above the flood zone line that is approximately 6 feet above ground level at the site. The code calls for 25 feet, but many buildings in the area surpass that and 2 properties at 1350 and 1370 Gulf Boulevard have received variances to 80 feet within the past three years. Design and construction plans that have been revised by the developer seek various deviations to the Community Development Code including set backs, distance to neighboring properties and building height, all of which pose problems according to opponents. The issues are now under review by the Clearwater Planning Department and a report should be available in August with city staff recommendations concerning the variances. The board will study the report before taking action on the issues at their August 19th meeting at city hall. Sandy Key residents who want to go to Clearwater Beach today will have to use the Belleair Causeway and Memeorial Causeway. Access via the Sand Key bridge will be closed for the implosion and television coverage of the Spyglass Hotel. Sand Key residents have gotten what they've been hoping for. 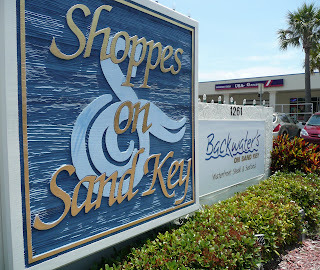 City Council has confirmed its earlier decision to zone the Shoppes on Sand Key “Commercial.” In 1986 the shopping center was zoned“Business”, a designation that is no longer used. The settlement that resulted in that zoning expired last year leaving the parcel without valid zoning. Property owner, D.A. 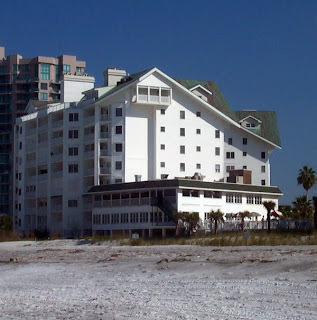 Bennett Company, the Clearwater had requested “Tourist” zoning, which would have allowed it to build a 100-foot-tall hotel on the site. But the council on March 20 instead instructed city staffers to set the wheels in motion to zone the property “Commercial,” capping the height of any building at 50 feet. Residents are very protective of the Shoppes, the only shopping center on the island. Although the Bennett Company says it has no plans to redevelop the property, even if “Tourist” zoning is granted, the residents are skeptical. The council voted 4-1 to zone the property “Commercial.” Councilwoman Carlen Petersen, was the lone dissenter. The Belleair Causeway will close to traffic at 7 pm Saturday July 26th and will remain closed until 7 pm Sunday July 27th. The 24 hour closure will allow workers to complete work that will minimize future lane closures during the day. Sand Key residents will need to use the Memorial Causeway in Clearwater Beach during the closure. Good news for pizza lovers, pizza is back at the Shoppes of Sand Key. The pizza restaurant that has been closed has been replaced with a new one. This is a new shop with new owners from Illinois, called Little Italian Pizza. We stopped in for a slice, $2.95 plus tax, and to check it out. It's not the the NY style I love, but it's very good, and very filling. Nice crispy crust and lots of cheese. They serve salads and other items as well, including Chicago style pies(smart move, have you seen all the Illinois license plates in town?). You can take out or dine in, and they will soon offer delivery. Update: Try the sausage pizza, the sausage is delicious! The Morton Plant Mease triathalon scheduled for this morning has been cancelled due to weather. Participants will be emailed details about rescheduling.